The northern island of Hokkaido is turning to manga to instruct residents how to respond in the event of a North Korean missile launch. The prefecture has been under the North’s missile flight path in recent months and municipalities have been organizing evacuation drills in preparation for similar threats in the future. 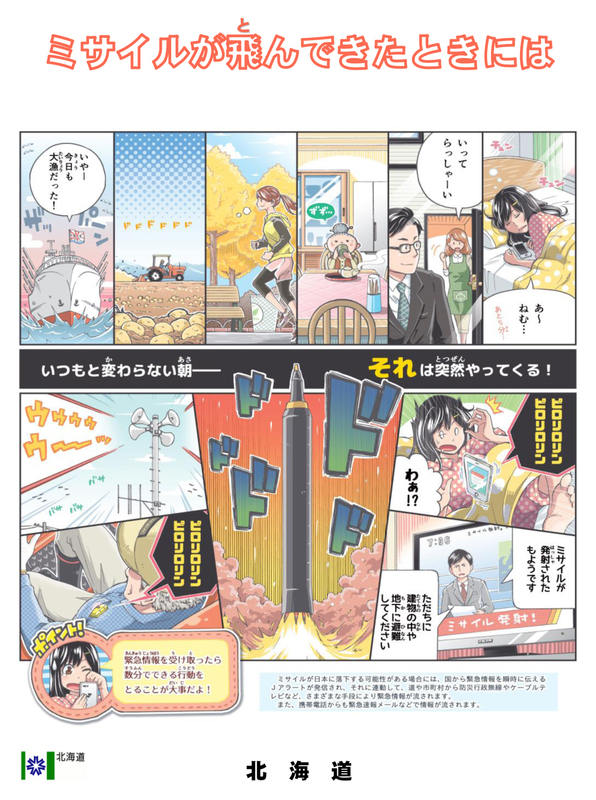 The four-page, A4-size comic penned by manga artist Manabu Yamamoto, who lives in Hokkaido, depicts multiple scenarios people may find themselves facing when the government’s missile alert system, known as J-Alert, goes off, warning of the a projectile’s imminent approach. 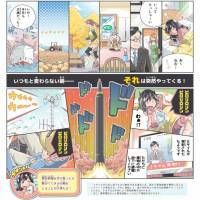 At a school, the manga illustrates a teacher telling students to stay away from windows and hide under desks. At a park, it shows a female jogger taking refuge in a public toilet, while a farmer is seen keeping a safe distance from his tractor and lying low in a field. The manga also instructs how to react when on board a ship at sea, or when at home or while commuting to work in a car. North Korea, which has stoked regional tensions with its nuclear program and frequent missile launches, test-fired an intermediate-range ballistic missile over southern Hokkaido in late August, and then again in September. The successive launches have raised concern among residents of Hokkaido and other prefectures near its flight path. In recent months evacuation drills have been conducted in various locales nationwide, while the government has been raising awareness by posting a list of steps to follow in case a missile lands on Japanese territory. The manga manual, which can be viewed on the Hokkaido government’s website, will be distributed in digital format to schools and municipalities within the prefecture. “We believe it’s the first case in Japan for a prefecture to issue missile-evacuation instructions in manga form,” the government official said.